For marketing professionals, the word ‘holiday’ is packed both with promise, and a sense of tension. The potential for bigger and better sales, more customers, leads, and a general interest in your product increases exponentially if framed and promoted properly around the year’s many holidays. Now, cue every other marketer in the known universe blasting off email reminders and creating festive landing pages, and you have yourself a healthy dose of competition. And how does one rise above the pack? While this is a subject that deserves its own article, trust in this: choose your holidays wisely. In the realm 24/7 social media engagement and activity, there is no shortage of holidays to capitalize on. Every day seems to celebrate something; whether it be hugs, entire countries, or pie. Your job is to filter out the holidays that are most relevant to your business, in order to ensure maximum levels of audience engagement. The start date for grand resolutions, New Years Day (and the eve before) mark a time of hope and new beginnings. Take advantage of a day where most people are off work scrolling through newsfeeds and nursing a hangover. While the actual date varies from year to year, the ceremonial ending of the NFL season takes place on the first Sunday of February. With coveted ad spots at the halftime shows averaging at $4-million for 30 seconds, it’s a great day to celebrate competition, and the strength and reach of good advertisements. The annual day of buying things for those you love; Valentine’s Day is the ideal time to share a bit of sweet sentimentality. [Read our latest Valentine’s Day article] for in-depth information on how to make the most of this billion-dollar holiday. With approximately 1.3 billion consumers celebrating the New Year in February rather than January 1st, the Chinese New Year is an important holiday that tends to slip by unnoticed. Marked by themes of luck and celebration, the New Year takes place on a different day each year according to the new moon—which comes between 21st of January and the 20th of February. Family Day is a statutory holiday occurring on a Monday in February. In the provinces of Alberta, Manitoba, Ontario, New Brunswick, Nova Scotia, Prince Edward Island (PEI) and Saskatchewan. In Alberta it is observed on the third Monday of February. The celebration of the world’s fauna is an excellent excuse to post a photo of a cute, cuddly, or ferocious member of an endangered or vulnerable species. A day celebrating half of the world’s population, International Women’s day is the best time of the year to promote female inclusivity, gender equality, and fundamental human rights. And in a year marked by #MeeToo and a number of other revelations, the day’s importance should be emphasized. A celebration of Irish culture in all of its facets, St. Patrick’s Day has morphed into a celebration of fun, luck, festivities, and parades showered in all things green. Capitalize on the infectious fun. One of the only religious holidays on our list, Easter is both a celebration of the resurrection of Jesus and a day famed for the Easter Bunny. And while the date varies from year to year, think chocolates, think fun, and think Spring sales. Held on the second Sunday of May, Mother’s Day is a great opportunity to evoke feelings of warmth and kindness towards mothers, sisters, grandmothers, etc. as their significant others set out to buy flowers (specifically), and a bevy of other gifts. Victoria Day is a federal Canadian public holiday celebrated on the last Monday preceding May 25, in honour of Queen Victoria’s birthday. The holiday has been observed in Canada since at least 1845, originally falling on Victoria’s actual birthday (24 May 1819). Celebrating dads, grandfathers, and brothers everywhere, the lead up to Father’s Day is lined with sales. Take advantage of a day championing togetherness and gift-giving. Canada Day is the national day of Canada. A federal statutory holiday, it celebrates the anniversary of the July 1, 1867, enactment of the Constitution Act, 1867 (then called the British North America Act, 1867), which united the three separate colonies of Canada, Nova Scotia and New Brunswick into a single Dominion within the British Empire called Canada. Originally called Dominion Day, the holiday was renamed in 1982, the year the Canada Act was passed. While the day varies for each academic level and school board between late August and early September, make sure to capitalize on the fact that everyone is buying brand new things to last a whole year of study. It’s the federal holiday that celebrates kicking back and doing as little work as possible. Keep the sales flowing since most will be spending their time at home and online. Get your turkey feast on! As families gather together for a dinner celebrating the harvest and overeating in equal measure, make sure to promote feelings of community and friendship. The spookiest of the holidays, Halloween is the day when little ghouls and goblins take to the streets for some well-earned trick-or-treating. With scary movies in the theaters, ghost stories told around the fire, and jack-o’-lanterns appearing on doorsteps everywhere, Halloween is a day for lots of laughs and plenty of scares. Remembrance Day (sometimes known informally as Poppy Day) is a memorial day observed in Commonwealth of Nations member states since the end of the First World War to remember the members of their armed forces who have died in the line of duty. Following a tradition inaugurated by King George V in 1919, the day is also marked by war remembrances in many non-Commonwealth countries. Remembrance Day is observed on 11 November in most countries to recall the end of hostilities of World War I on that date in 1918. Hostilities formally ended “at the 11th hour of the 11th day of the 11th month”, in accordance with the armistice signed by representatives of Germany and the Entente between 5:12 and 5:20 that morning. (“At the 11th hour” refers to the passing of the 11th hour, or 11:00 am.) The First World War officially ended with the signing of the Treaty of Versailles on 28 June 1919. Small Business Saturday® – a day to celebrate and support small businesses and all they do for their communities. Please join in supporting your local small business by shopping at a small business. First observed in the United States on November 27, 2010, it is a counterpart to Black Friday and Cyber Monday, which feature big box retail and e-commerce stores respectively. By contrast, Small Business Saturday encourages holiday shoppers to patronize brick and mortar businesses that are small and local. The Twitter hashtag #SmallBusinessSaturday has existed since early 2010 and was used to promote small businesses on any Saturday (not solely that Saturday between Black Friday and Cyber Monday). With Christmas sales taking place throughout the month, the corporate-minded holiday celebrates all things warm, cozy, and jolly. Makes sure to promote that gift-giving spirit. The day that sets off a week-long sales bonanza, Boxing Day is the last time of the year to liquidate stock and to cash in on those with Christmas gift money lining their pockets. While the holidays you promote should depend on your line of business, take this handy guide and plug it into your marketing calendar. Don’t be left behind when sales opportunities arise. 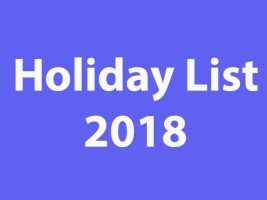 For an in-depth look at all possible holidays from around the world, head on over to Google Calendars, and make sure to save the dates for each of the holidays above.